When I heard word of a self-help workbook in the works about a promising new kind of CBT for body dissatisfaction called acceptance and commitment therapy (ACT), I made a mental note. A Harvard Medical School-affiliated psychotherapist and author of "The Self-Compassion Diet"
Walk into a psychotherapist's office complaining of bad body image and you're likely to get a short course of cognitive-behavioral therapy. That's because CBT, the goal-oriented psychotherapy that counters counter-productive thoughts, feelings and behaviors, is the only clinically-proven treatment for body-image issues. When I heard word of a self-help workbook in the works about a promising new kind of CBT for body dissatisfaction called acceptance and commitment therapy (ACT), I made a mental note. In this unfolding series on body image, I'm committed to blogging about how to improve body image. Imagine my surprise when I discovered that Emily Sandoz, the author of the upcoming Mindfulness and Acceptance Workbook for Body Image, is one of the psychologists who coauthored a book that visually resembles my own. The apparent difference between our two book covers is strawberries and blackberries, literally. Both covers feature a handful of fruit. The cover of my book, The Self-Compassion Diet, serves up a generous portion of strawberries. 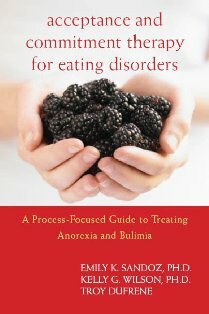 Sandoz's Acceptance and Commitment Therapy for Eating Disorders offers a bounty of blackberries. 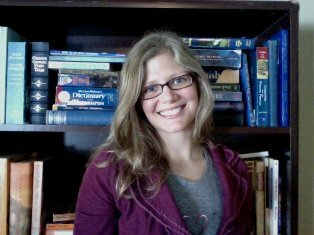 Turns out, this assistant professor of psychology at the University of Louisiana and I have more in common than book covers. Not only do Sandoz and I both write, we also teach and practice psychotherapy. What's more, after specializing in disordered eating, we both developed an appetite for treating body-image issues. Although we're both well-schooled in traditional CBT, only Sandoz has embraced ACT. I've meant to study this more mindful CBT approach but, truthfully, I've been kinda busy. With no shortage of reasons to consult with Sandoz, I set up a phone interview. What follows are questions and answers from our recent conversation. The concepts Sandoz espouses are revolutionary but difficult to grasp, which has been my main problem with ACT. Every book I've tried to read on the subject has been difficult to digest. Happily, these concepts are easier to swallow in Q&A format. Q. What is acceptance and commitment therapy? A. ACT is a new cognitive-behavioral therapy. Traditional CBT says that when our thoughts are better, when they're more accurate and less distressing, then our behavior will be better and we'll be more effective in our lives. A traditional CBT approach would say you need to think positively. In ACT, we would say: "Who cares what you think? Can you pursue effective behavior and a meaningful life no matter what's going on in your head?" That's the main difference. Q. What drew you to study, practice and now write a book on body image? A. [In working with disordered eating,] I saw that body-image difficulties don't seem to be connected to what actual bodies look like. You could have two women that look totally different but who have the exact same distress about their body. In my [clinical] experience, I saw that everybody had an area of their body that they were narrowly focused on. When women pick up a picture of themselves, what's the first thing they look at to decide if it's a good picture? Their eyes are first drawn to whether or not their hair is straight, how their belly bulges, or how the clothes fit around their hips. I also saw that losing weight or changing appearance didn't always get rid of that [narrow focus]. People could go through great efforts to change their appearance, but their thoughts and feelings about their appearance didn't necessarily [change]. Finally, I saw how body image could disrupt people's lives in almost any area. It isn't just about eating, it's about the way people apply makeup and avoid physical intimacy. It's even the way it interferes with things that seem totally unrelated, like speaking up in class or pursuing a particular job where you have to wear certain kinds of clothes you don't feel comfortable in. When [you struggle with body image], you become inflexible. You have particular things you do that are very focused on your body that bring you away from other things you care about. In ACT, we call those things "body-image inflexibility." Q. To my knowledge, CBT is the only treatment with a proven track record for boosting body image. Is there any research supporting the effectiveness of ACT for body-image issues? A. There are some initial studies, but because of the relative newness of ACT, we're only now publishing the measures. With ACT for body image, what we're hoping to see is increases in body-image flexibility and not necessarily body-image satisfaction. We wouldn't say that we expect ACT boosts body image. If our measures were just focused on symptoms, it looks like ACT causes people more distress. [Subjects who learn ACT generally] report more distress, [but they also report] more effective living skills in handling that distress. The primary purpose in ACT is having more meaningful or effective action in their lives -- what we call "valued living." Unfortunately, valued living is hard to measure. Q. In other words, the more distressed you feel, the more capable you are of living a meaningful life. How counterintuitive! A. It is, and yet it fits with our experiences. Let's say I'm a young woman and I'm starting to become more uncomfortable with my body. One thing that's likely to happen is that I'll feel distress in other situations when I'm stressed out. So if I fail a math test, I might feel fat. Or if I say something in class that's not the brightest thing, I might feel ugly. All that distress becomes manifested in how I'm thinking and feeling about my body. What we're suggesting is that the situations where you're most likely to feel distress are often those that are really important to you. They are situations where it's important to stay the course of your effective behavior, to accept and open up to that distress, and to continue moving forward. Q. The ACT approach to bad body image sounds a lot more realistic than plans that aim for unconditional love and acceptance. You're actually teaching individuals how to accept reality -- the good, the bad and the ugly. A. Most people whose experience of their body interferes with their lives don't seek individual therapy. But it [their distress] comes to the attention of a psychologist or a psychiatrist [by way of a] referral from a surgeon. So it doesn't make a whole lot of sense to only focus on the development of individual psychotherapy. Instead, what my research focuses on are prevention avenues. Can we go into sororities? Can we train the sororities to train the Girl Scouts? Can we train them [young women] to openly experience their negative thoughts and feelings about appearance without having to turn away from those thoughts and feelings? One of the biggest things I hear [when I run ACT groups] is why doesn't anyone tell us that it's normal to feel bad about my body? Q. In my clinical experience, acceptance can be a hard sell. How do you sell clients on accepting what they've probably spent a considerable amount of time, effort and money to change? A. I rarely talk about acceptance initially. What I talk about instead is avoidance -- the way that trying to change your feelings and thoughts about your body has interfered with your life. I [might] ask: "What kind of things that really matter to you have you sacrificed to try and manage your feelings about your body? What if thinking thoughts like, 'As soon as I take care of my body, then I'll get on with my life,' is keeping you from getting on with your life?" In ACT, what's unique is we link acceptance to living a meaningful life. [To get at the idea of acceptance without talking about it, I ask questions like:] "Would you be willing to have these terrible thoughts and feelings about your body if it meant you're able to live the life you want to live? Would you be willing to feel distress about your body image if it meant you could be more present with your children? If it meant you could be more active in your community? If it meant you could pursue companionship? Would that be worth it to you?" To the extent that it would be, then those [distressing] experiences become signals to a person that they're on their path. When they're feeling bad at their body, they can stop and say: "What's going on? What's at stake that I really care about?" Q. These concepts are revolutionary, but difficult to grasp, which has been my main problem with ACT. Every book I've tried to read on the subject makes my brain hurt. A. That's why I don't [announce] in groups that we're going to talk about acceptance. What I do instead is get people to notice all the ways they try to change their thoughts and feelings about their body. I get people to notice all the time and energy they spend on that, which they might rather spend on things that are more meaningful to them. Then we focus on what if you shift all that energy from this struggle to the things that really matter to you? When people can get that [the importance of accepting vs. avoiding their reality], then we can teach acceptance in a more specific way. Acceptance doesn't necessarily mean liking your body and giving up efforts to change it. It doesn't mean liking the way you think or feel about your body. It also doesn't mean clenching your teeth and sitting through feeling terrible. It's a much more open posture. The way we cast it is "Are you willing to have [these terrible thoughts and feelings] if it means you can move toward something you care about it? Are you willing to go to the park with your kids because you want to spend time with them even if you just threw your hair in an [unflattering] pony tail and you might see someone you know? Are you willing to be in your best friend's wedding and wear a dress you're not going to feel particularly comfortable in? Are you willing to have a physical relationship even if it makes you feel more self-conscious?" Q. Is there a simple ACT practice you can prescribe to readers? A. There is, but it's not unique to ACT. Looking at yourself in the mirror, focus on equally experiencing different aspects of your body. A lot of women with body image difficulties tend to hone in on something they don't mind about their body or something they really mind. [Rather than honing in on any one part, allow yourself to] experience your [whole] body. When judgments come up, like "Oh my god, I need to lose weight" or "Look at those stretch marks," just notice them. Notice feelings, too. Maybe it makes you feel fat or frustrated or disgusted. Sometimes we incorporate values into the practice. So imagine that every extra instant you spend doing this practice will bring you closer to whatever you really value. Q. Tell me about the body-image workbook you're writing. A. It's a self-help workbook [slated to hit bookstore shelves in 2013] with an [audio] disc of [guided] practices. Each chapter will focus on different aspects of psychological flexibility, and will include one and sometimes three different practices you can do at home. Q. In the meantime, where can readers learn more about ACT? A. There are quite a few resources on the ACBS website (the Association for Contextual and Behavioral Science). There are listservs for people who are trying to wrap their head around this stuff. There's also a directory for finding an ACT therapist. For more by Jean Fain, L.I.C.S.W., M.S.W., click here.